Cupcakes are an all time favourite. What could get better than them? Yes, mini cupcakes! These bite sized wonders are easy on the eye and in the mouth. That day my whole intention of baking cupcakes was to frost them. I wanted to get it right this time after a huge flop show the previous weekend. I had made a pineapple cake and had attempted to make frosting at home. The catch was that I was planning to make cream frosting without an electric beater. I did my youtube and google searches and found enough encouragement there to fulfil my desire to make frosting from scratch without the beater. It turned out to be a 2 hour high voltage drama. I must have given off sparks by the end of it going by the amount of focus and friction the whole act of beating by hand was producing! Although I dint lose hope by the end of the first hour when the liquid that I was beating steadfastedly remained in the same state, I threw the whisk into the sink by the end of the second one. Then I hit upon a brilliant idea of running it through my mixer and that resulted in churning the cream and butter back to nice butter. I did frost my cake with this buttery something and we did scrape it all (2 layers) off before eating the cake. Thus bringing to an end a saga that I am not about to repeat. And then I wrote to Sin-a-mon's Monika and she gave me the idea of making ganache. Ganache has been an awesome discovery. I am going to experiment with different types of chocolate and post all about it here but my maiden attempt was with semi sweet chocolate chips and the heavy cream I had left over from my previously ghastly trial. I used the simple recipe from here.It gives a good idea on how one could use ganache to decorate cupcakes. And there are three different types - Glazing, Whipping and Piping. I did not want to Glaze since my family wouldnt like it so sweet. Whipping was out of question without an electric beater. So piping it was.This was my second time trying to pipe and the first time I did was just a whirl. Getting back to the cupcakes on hand, this recipe is an absolute keeper. It is eggless and uses oil instead of butter. The texture of the cupcakes are dreamy soft and so delicate. It is easy to put together and with the right pictures it is easy to remember how to make them as well. I have had my share of tighter cupcakes or sunken ones, but this time I have got it right with the measurements mentioned. These cupcakes can be eaten without any frosting and would still taste great. Alternatively, a sprinkling of nuts on top or mixed inside would render a crunchy good flavour. Any kind of frosting would taste good on such a basic cupcake so its a base for creativity. I brought it with me for a party and got extremely encouraging feedback from the crowd that had gathered there. Many could not believe that it was eggless. Prehaet the oven to 350. Line cupcake tray with paper liners and keep aside. Stir together milk and vinegar and set aside for 5 minutes. The milk should be curdled by the end of it. Once milk is curdled, whisk oil, vanilla extract and sugar into it till well combined and runny. Make a well in the center of the dry ingredients and pour the wet ingredients into it. Mix till smooth. Do not overmix. A little lumpy is fine as long as everything is mixed well. Fill into cupcake liner till 3/4 full. Sprinkle nuts on top if desired. 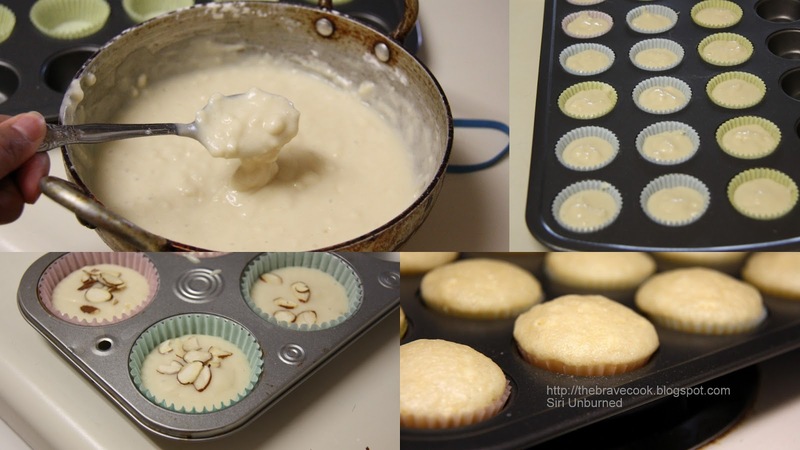 If making mini cupcakes, bake for 10 minutes. If regular sized cupcakes then bake for 16-18 minutes. A skewer inserted into the cupcake should come out clean and that tells you they are done. Remove from oven and cool in pan for 5 minutes before transferring to a wire rack and allowing it to cook completely. Cool the ganache for atleast an hour in the fridge for it to thicken to piping consistency. Fill a piping bag with the ganache and press down towards the nozzle so that air gaps are eliminated. This aids piping to flow out seamlessly. I used a small round tip (not familiar with the nomenclature) and made my own twirly whirly designs by squeezing on the piping bag with my left hand and guiding the tip with my right hand.